Mrs May has gone on a walking holiday in Wales.. and we all know what kind of farce that sort of thing can conjure up. Imagine her alone with her trusty advisor, Philip, for a whole week… [shudder]. So let’s laugh while we can, because heaven knows what crap she’ll come up with while she’s away. So, it occured to me that there are now two Brexit parties lining up for the EU elections. Firstly there’s Nigel’s party, launched last week (which, if I’m not mistaken, has lost its leader already) and then there’s super loonie “new” UKIP (even nuttier than before), which seems to have lost a lot of support, not least that of its own MEPs. From 24 members elected, they are down to four serving members at the last count. The defections are probably because of the hard right-wing stance of the latest in the party’s sad succession of leaders since Mr Farage declared “job done” and resigned back in 2016. Mr Gerald Batten (at least it wasn’t Battenberg!) and his close advisor, Mr Tommy Robinson or (on Sundays) Mr Stephen Yaxley-Lennon make some of the previous holders of the post seem almost normal. Just imagine being too nutty for the likes of Coburn? The thing is, that while I admit that there is going to be a fair number of people who will want to vote for one of the hard-line Brexit parties and secure a no deal Brexit, didn’t it occur to them that having two parties standing in every seat is going to split the vote and let other parties through the middle? So don’t be surprised if you get calls from insurance companies. The Tories have to make money somehow. Jeez… who told you that doing deals with the devil was a good idea? Actually, I’m not sure that I know which one of them I’m addressing that to. Both? 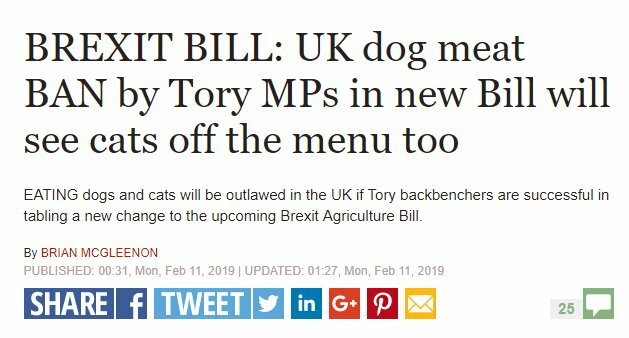 Ah, wait, if we can’t eat our pets… what about our neighbours? What happened to the 40 trade deals you told us you’d have ready on the day we left. 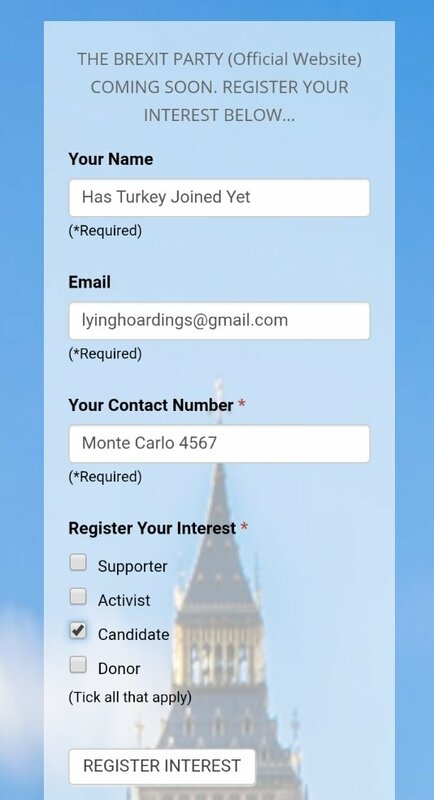 So far, I understand that Switzerland and the Faroe Islands have signed up. And given that you’ve flown around the world 4 times, first class, in the getting of them, I think that’s fairly crap value for money, don’t you? Unless you count the market in black market food. I’d say that Nigel Farage’s new party just made a no deal Brexit a lot more likely, given that if the Maybot fails to do what “the British people ‘apparently’ voted for”, ie cut their throats and stab themselves in the heart, then the Tories will lose big time to old Nigel at the next election. Oh, what fun we are having.